One of my purchases was a pork loin, and luckily, a craving for curry, a well stocked pantry, and inspiration from Grace Parisi of Food & Wine saved me. This absolutely simple little Pork Curry Stew recipe can be prepped in about 10 minutes and simmered slowly until tender on the stove-top or in a crock pot. I’m calling this the little black dress of recipes – as is its delicious, with just a bit of a mild curry flavor (translate perfect family fare) but I’ve already thought of a number of ways to dress it up. This little dinner came in at a great price, about $4.85 plus a few pennies for the rice, but some of the variations, below, can easily lower the over all cost. Fresh vegetables often run around a dollar a pound or less and adding them means either the more expensive meat can be cut back to serve the same amount of people, or you’ll get more servings from the same amount. Plus, the healthiness of a dish is always increased by a few more veggies. The flavor of the stew is lovely as is, but could be easily nudged a bit in other directions with just a few minor changes. Your braising liquid will need to be about 1/2 inch below the level of the food in your pot so more veggies may slightly alter the amount of liquid needed. Add a bit of broth or water or a little more coconut milk if you need to raise the level. A healthier version would include a leaner meat than the original recipe – I used pork loin rather than the original shoulder and simmered until just tender. A few frozen peas added a bit more vegetable but still kept it simple. Chicken or Chickpeas would also make a marvelous substitution for the pork, and sturdy greens added in towards the end of the cooking would be in keeping with the flavors. A spicier version could be made by adding in a few hot peppers, liberally pierced with a fork, being a little more liberal with the spicing, using a less generic curry powder or a curry paste. A splash of Sriracha or a little chili powder or garlic chili sauce will certainly liven things up a bit. If you’d like to lean toward Indian flavors, substitute a good Garam Marsala for the curry powder, add in a pinch of clove, a jalapeno or Serrano pepper and garnish with cilantro and any of the classic curry accompaniments like a mango chutney, peanuts or coconut. Cauliflower and peas would be marvelous in or along the dish. If you’re leaning towards Island flavors, drop in a Scotch bonnet, add a good pinch of allspice and a tablespoon of vinegar. A sweet potato or two or butternut squash cut in chunks and added to the stew would make this a more complete meal, and you couldn’t go wrong with tossing a few greens into the mix. If you love the flavors of Thai food, substitute the curry powder for a curry paste, use the whole can of coconut milk, omit the tomatoes and add in a splash of fish sauce, a pinch of sugar, a Serrano pepper and the zest of lime. Liquid may need to be added to raise the level for braising. Bell peppers, perhaps baby corn or snow peas added in toward the end and simmered just until crisp/tender make a lovely dish. chicken stock or low-sodium broth, water or additional coconut milk to bring the level of the braising liquid just below the level of the stew. In a Dutch oven, heat the oil. Season the pork with salt and pepper. Add the pork and brown it over moderately high heat, about five to six minutes. Set the pork aside. Pour off all but 2 tablespoons of the fat in the skillet. Add the onion, garlic, ginger, curry, cumin and turmeric and cook over low heat, stirring, until fragrant and the onion is softened, about 5 minutes. Add the tomatoes and their juices, coconut milk and stock, bring to a boil, then turn down to a simmer. Partially cover, leaving lid ajar. Simmer, stirring now and then, until pork is tender when pierced with a fork, about an hour to an hour and a half. Serve the stew over rice in deep bowls, garnished with cilantro and scallions. If desired, and using any of the variations above, add vegetables at appropriate times. Hot Peppers should be added to simmer along with the pork and sauce at the beginning, sweet potatoes and potatoes after the pork has simmered 35 minutes or so, Cauliflower and Greens about 25 minutes before the dish is done (Cauliflower should be cut into fairly small florets) and Peas should be tossed on top and stirred in when the dish is done. This entry was posted in Click here for Bargain Meals, Click here for Fabulous Food Posts and tagged Bargain Meal of the Week, Cauliflower, coconut milk, Easy Recipe, Frugal Hausfrau, Peas, Peppers, Pork, Pork Loin, Tomatoes. Bookmark the permalink. What a great quick meal! Going to give this one a try! Great! Feel free to stop by and comment back – I always love to hear what others think of a recipe! Well Mrs. Frau, this looks like a dish my family would love. I’ll let you know how it turns out! Thanks! I’d love the feedback! 🙂 It is so easy and tasted much more complicated than it was! 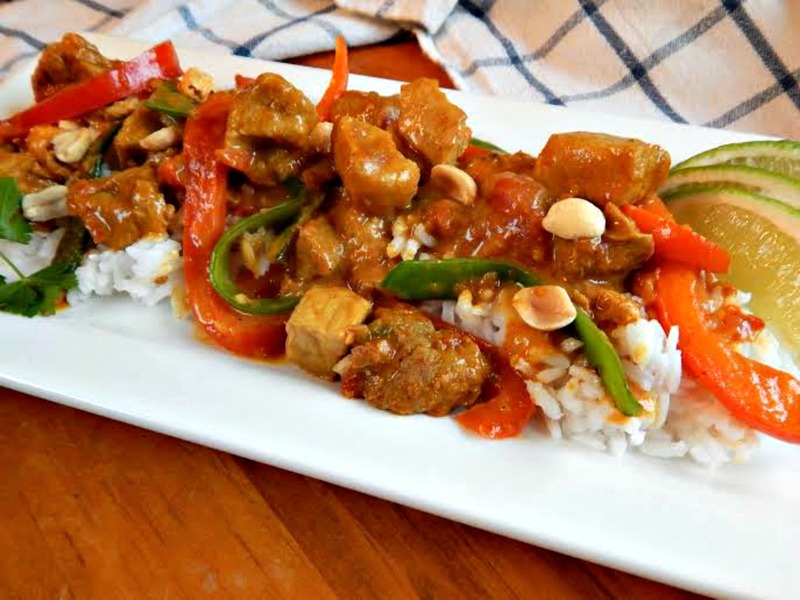 I like yours a lot but Love to spice up my curry a bit more,…Yumm! You and my son! I always have a lot of different hot sauces and such on hand, and sometimes toast and blend my own spices, but this was a nice “basic” sauce, not hot at all, but surprisingly good. I like all of the variations you’ve included with the recipe…great ideas. Seems to be a curry week. 🙂 Great recipe! I know, and I love your post with the from scratch curry! I haven’t had a really great Chinese curry since a little dive nearby closed. Slices of tender chicken, green peppers and onions and a really simple tasting curry sauce over rice. That’s what I would aim for flavourwise and I’d use a pork loin if I were going to use pork. This is a bit more like a stew, and really an American type curry, but I have a recipe on here that might be quite a bit closer to what you’re looking for! It sounds too simple, but that is because it uses a curry paste. It fantastic and sometimes I CRAVE it, I swear! It’s made with chicken. The chicken curry looks tasty but the coconut milk makes it a different curry than the one I’m looking for which is more of a cornstarch based curry sauce. Delicious, love curry and have never curried pork. Wonderful meal!! Me either, before this! Chicken, Beef and once, Goat. Oh, and Lamb. Ha, sounds like I’ve had everything, practically, BESIDES pork! 🙂 At least everything I’d be willing to eat or able to find!